Want some free patterns for gingerbread houses? Interested in trying one of our unique gingerbread house patterns but you'd like to see what you can expect first? No problem. We offer two free templates here. Our basic gingerbread house pattern and our adorable basic gingerbread cabin/cottage. Try one or both. If you enjoy them, and we know you will, come back and try one of our less "cookie-cutter" patterns next. This is a basic gingerbread house pattern that can be made quickly and easily. Decorate it however you wish, enjoy, and make sure to come back to this site and share your photos! Here's another freebie! This one differs only slightly from the basic gingerbread house pattern (slightly more A-frame, with a steeper roof and shorter side walls) and can be made just as quickly and easily. 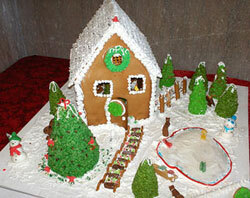 It makes a terrific gingerbread cabin or cottage. Don't forget to check out our other gingerbread house patterns here. 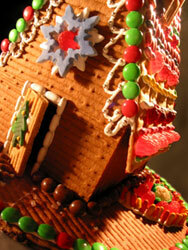 You can also enter your wish for a particular style of gingerbread house on that page as well. Always wanted to build a particular building out of gingerbread but didn't know where to begin? Ask us! You never know - Our inner architects enjoy this stuff! Return Home from free patterns for gingerbread houses page.